The New Year is often a great time to reflect on what has passed and to examine how we can prosper and grow from the knowledge it imparts. The Months of Inventory (MOI)* for all home types has been hovering around 5 months for nearly two years. It dropped to around 5 months after a steady rise from mid 2011 to late 2012. 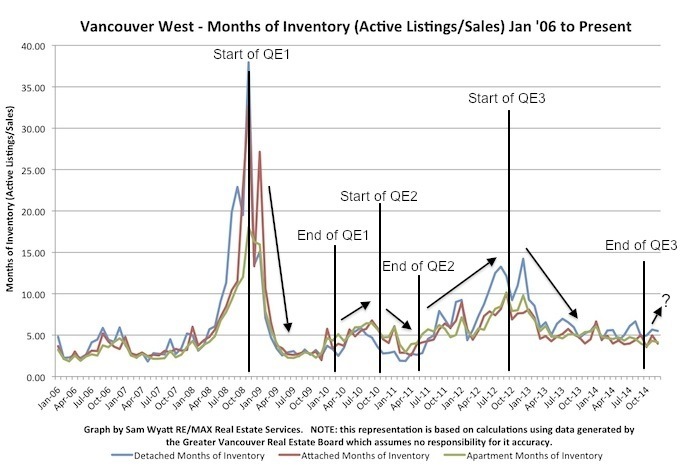 In January 2013 the MOI for Vancouver's Westside detached homes was up to 14 months and it looked like the market might plunge (I personally espoused this likelihood) - but it didn't. What happened instead was that the US Federal Reserve Bank (Fed) started its "Quantitative Easing 3" (QE3) program. QE3 saw the Fed buy back $85 billion dollars a month of bonds and mortgage backed securities until late 2013 when they began to taper their purchases by $10 billion a month. The program just ended in November of 2014. "Quantitative Easing" (QE) was first introduced by the Fed just after the credit crises of 2008. It is a process in which money is effectively "printed" as the Fed simply credits (just types in some new totals) its member banks' accounts in "payment" for the securities it buys. What can clearly be seen in the MOI graph above is that the introduction and ending of the various rounds of QE are correlated to the rise and fall of the MOI index. This is most likely due to the effects the QE programs had on mortgage rates. This is significant and should not be ignored. What might have happened to the MOI if the Fed had opted not to introduce QE3? MOI seems to have been quite sensitive to the QE programs both when they started and finished. Prices, however, appear to have been far more sensitive to the introduction of QE programs and less so to the end of those programs. The result is that prices have gone up considerably, particularly for detached homes, with only small reductions and short downturns in the upward trend since 2009. The explanation for this is that prices are "sticky" on the way down. No one wants to sell their home at a loss and they will often choose to stay put rather than sell if the market is soft. This means that prices in protracted soft housing markets get set by those who have little choice, like foreclosures, job moves and divorces. The Vancouver real estate market has been the unintended beneficiary of a gargantuan influx of money into financial markets thanks to the Fed. 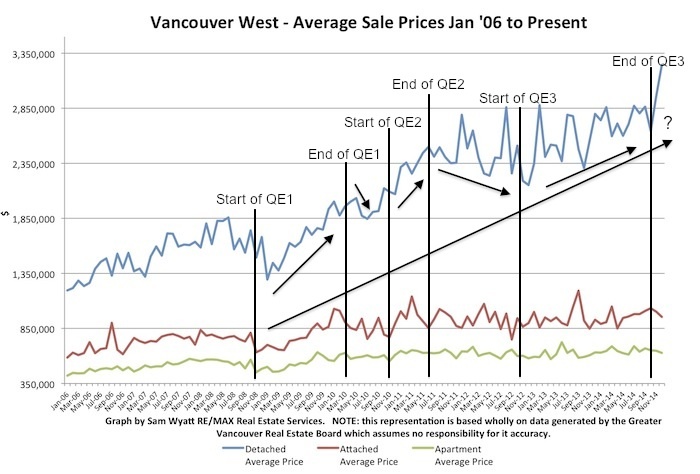 However, rest assured that the Fed does not worry about whether or not house prices rise or fall in Vancouver. The obvious question for me is: what is going to happen now that QE3 has ended? My own sense is that if the US economy does well, that Vancouver real estate will suffer and that if the US economy does poorly that Vancouver real estate will prosper. My rational is this: if the US economy does poorly there is a strong probability that the Fed will introduce yet another round of stimulus. If history serves us well, then Vancouver house prices will probably rise. If, on the other hand, the US economy does well, then there will be no reason for the Fed to intervene in financial markets and Vancouver will be left to its own devices. One of the much touted influences in Vancouver real estate is foreign capital, particularly Chinese money. In 2011, Landcor Data Corporation showed that 74% of the 164 homes that sold in 2010 for over $3 million on the Westside were purchased by people with "mainland Chinese spelling variants and who did not have a legal Western name". The Chinese money in Vancouver has since abated but there is no question that foreign capital continues to be a significant factor in what is a "top down market". I call it a "top down" market because rather than prices going up due to demand for housing by first time buyers of lower cost real estate, money from the sale of the most costly properties has moved down the market chain as sellers downsize into less costly real estate, driving up prices to a proportionally lesser extent at each lower cost level as it descends. This is why, even as average detached sale prices have doubled since 2009, studio apartments in Gastown have had little if any upward price movement. 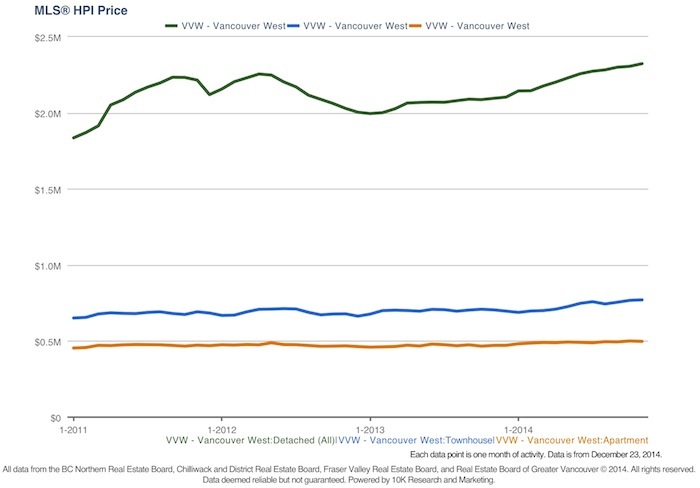 The Real Estate Board of Greater Vancouver's "HPI Price" for Westside homes helps smooth out the bumps and shows the steady rise in values for "typical" detached homes. Oil prices have fallen sharply and with them, the Canadian Dollar. The lower cost of the Canada Dollar is bad news for Canadian consumers but it is a potential windfall for foreign buyers. One might look at this and conclude that prices will continue to rise unabated and this may be true - but I doubt it. 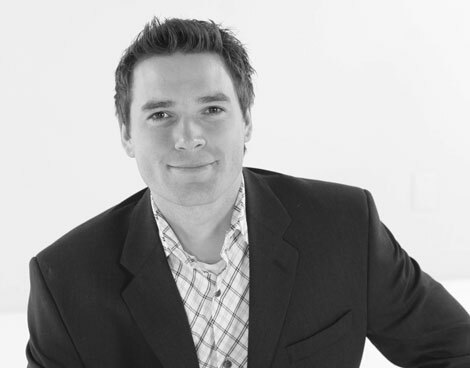 Just as oil prices fell without warning, the Vancouver real estate market could do the same. The stagnant mining sector, economic or political trouble in China, no stimulus from the US Fed and fewer jobs and lower tax revenues from oil production - any one of these could be enough to shake our market. I am hopeful that Vancouver real estate will remain steady and stable but I am also vigilant to the possibility that it may not. When purchasing a home, do be conservative and plan for rising interest rates and other life realities like job loss. Lastly we should examine the long term trend of MOI. The lowest MOI is consistently in the spring and the start of the market seems to come a little earlier each year. If you are thinking of selling please contact me right away so we can get you ready to sell in time to capitalize on this cyclical trend.